It hardly seems possible that it's been a month already since I picked up Elsa and Vinny! Things have settled into a routine for the most part and have gotten easier. Pups know the daily routine, and I know their potty schedules. They are sleeping through the night. Sweet Elsa left for her forever home a couple days ago. I am so thrilled for her and for her new family! 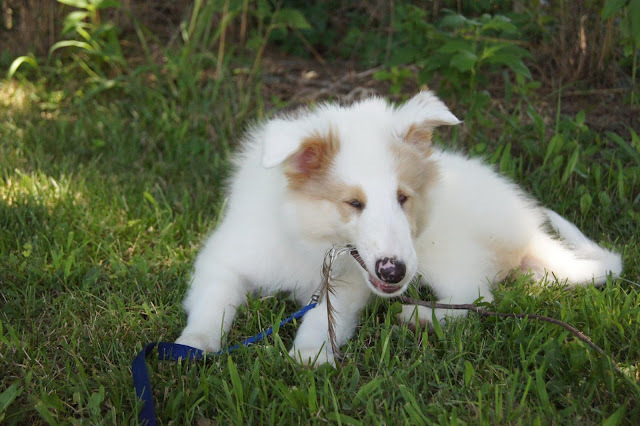 She is in an experienced double merle home that will help her have every opportunity to shine and develop her full potential. Plus, I will get to see the updates and pictures of her growing up! 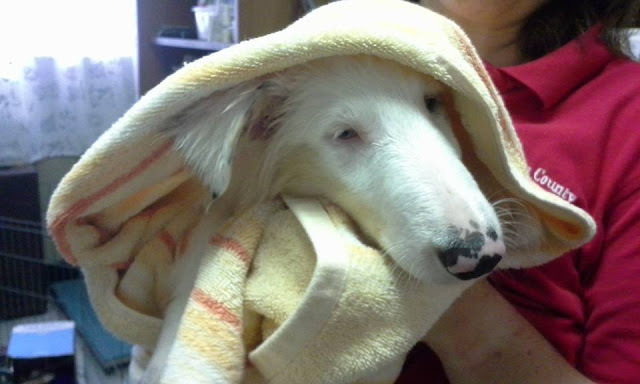 In preparation for her going to her new home, both puppies got their first bath. Elsa was content while I got her wet and soapy, but then decided during the rinsing that she was not a happy camper. She complained extensively and loudly! But she was oh so very white and sparkly afterwards! Vinny wasn't quite as vocal, but he was frustrated with the whole thing. Vinny has had a harder time with containment and restraint since he came home with me. He is learning more tolerance one situation at a time, but he did not like being contained to the tub and wanted to go exploring. He was very wiggly to give a bath to! Continued socialization this week included meeting and playing with new people, taking long lead walks in new areas for playtime and sniffing, nail cutting, new meal toys, new fenced areas to play in and explore, new adult dogs, and new obstacles and toys. Both puppies take it all in stride. Interestingly, Elsa, who is the more rough and tumble and active of the two, can be the one who stressed quicker. This has been seen in her giving up easily with the food challenge toys. Also on our long lead exploring walks, she is confident and happy for the first 10 minutes and then she starts to get a bit concerned about getting back to some place she knows and is comfortable with. Because these experiences are meant to be positive ones for her, I allow her to go back to places she is more comfortable with when she decides she's had enough. Some interesting things happened this past week. When exploring a new play area, Vinny discovered a plastic drain pipe spread along the ground. He stepped over it in one direction, turned around and then stepped back over it in the other direction. This continued as he went first one way and then the other, just as proud as could be stepping over the drain pipe. Even when he seemed to tire of his new game and he went off to explore other things, he continued to come back to "his" drain pipe to step over it back and forth a few times. I don't know why he found it so fascinating, but it was fun to watch him. Vinny has gotten very confident on the few steps leading to the outside. I had stopped holding his collar to help guide him and only used the tactile cue at the top of the steps to let him know there was a step down. He has gotten creative and will take the first step down, and then make a flying leap down the last two! But to my surprise, he did not land in a heap at the bottom. He lands perfectly on his feet and has judged the distance perfectly. I tried to tell him he shouldn't be able to do that since he can't see anything, but Vinny was not impressed. My daredevil Vinny. So, I am back to holding his collar to remind him to take each step so he won't get hurt. I introduced Vinny (while holding that collar!) to the big flight of steps this week. He confidently went down the entire flight on his first try! He did stop after the first few and seemed a bit confused as to why there were more steps, since he had only done the few to the outside up until this point. But he did stop 1/2 way up that staircase and decided that was far enough, so I carried him the rest of the way. I wanted to work on some sits with Vinny for his lunch yesterday and wasn't thinking. We were near his crate and he smelled his food. So he was frantic to get himself into his crate to eat, and had a hard time focusing on his sit cue even with the food right at his nose. After letting him eat a handful of food from inside his crate, he did eventually come out and do some sit practice with me. So smart - I guess he showed me! He knew what he was supposed to do! Vinny knows his way from the back door to his potty spot and back in. He will lead me with little puppy bounces and happy circles around me as we go. He knows his way from the side door to the grass to potty and then to the car to head to work in the morning. His nose is getting more keen and he is more accurate with searching for dropped/hidden treats. He can also scent his way back home from our short walks to new places. While he is confident and happy on our way to a new area, on the way back he is leading with his nose in the air, trotting toward his yard.